Researchers from five European countries have come together to create next-generation “chemical noses” to eliminate industrial pollutants from the environment. The European Commission allotted €2.9 million to finance the Horizon2020 FET-OPEN project INITIO that will assemble scientists from TalTech and five other universities and also experts from an Interspectrum OÜ functioning in Estonia and an Italian company in a worldwide research project. 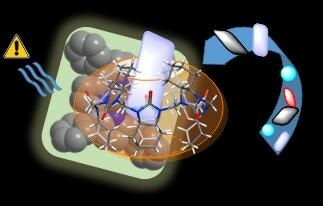 For five years, the supramolecular chemistry research group of the School of Science of Tallinn University of Technology has been busy in developing new-generation receptor molecules that would identify pesticides and other industrial pollutants harmful to the environment and transmit signals. Such smart “electronic-nose-devices” would enable dangerous toxins to be eliminated before they are released into the environment. Dealing with pollutants in the environment is becoming an ever-increasing problem. One relatively unknown reason for this is that many agricultural pesticides and pharmaceutical drugs that enter the environment are ‘chiral’, which means they exist in two non-superimposable forms (like left and right hands). This molecular quirk makes it difficult for the pollution control technologies to identify and remove many of these pollutants and this cannot be achieved by traditional methods for analysis. Additionally, “chirality” of substances has an effect on the environment where they are released to. For instance, one of their forms may be more harmful when compared to the other and the chirality of the molecules may have a direct impact on their environmental degradation. Chiral pollutants are present in fungicides, herbicides, pesticides, dyes, freon substitutes, antibiotics, and several other drugs. In the majority of cases, researchers don’t know about their impact on the environment. The collaborating INITIO consortium will deal with this important challenge by first producing molecules that act as receptors—that identify specific pollutants—and then combining them with smart nanostructures to develop devices that can be directly set up in the field to detect and eliminate the pollutants. These devices will basically act as “chemical noses” by sniffing out the particular industrial pollutants, thereby making their elimination and destruction easy. “Our research group will build the receptor-molecules for these chemical noses. We will make container molecules, the ‘hemicucurbiturils’, which were recently developed in the project funded by Estonian Research Council. Our researchers will also build chiral molecular systems with recognition and signaling functions to flag the presence of specific pollutants, e.g. through changing color,” states Professor Aav. The collaborative project will come to an end by 2021 and the ultimate aim of the project is to create a much more effective technology for cleaning the environment.